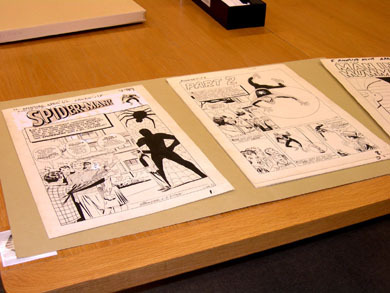 In case you hadn’t heard, the original art for the very first Spider-Man story from Amazing Fantasy 15 has been donated to the Library of Congress by an as-yet unknown donor. One thing that slipped by me was the surprising revelation that the logo on that first story was pasted over an earlier, completely different version that seems to be part of the art as drawn by Steve Ditko. You can read more HERE. Some of the links to this story previously on this page no longer work, so I’ve placed three of the photos below. Fascinating stuff. The logo — really more of a title — that Ditko drew is made of block letters outlined in little scalloped points, and filled with sections of spiderweb. Blake Bell points out that the word is NOT hyphenated, and corrections to the lettering in the story add hyphens to the name, so that was clearly a later addition. 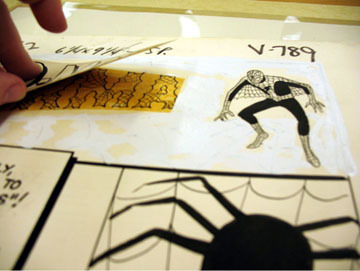 Apparently the Ditko logo was connected to the figure by more webbing, which was covered with white paint before printing, leaving just the new logo and the figure. I don’t think the Ditko version would have ever been used on the cover of the character’s own magazine, it’s too delicate for a cover logo, but it is a fascinating addition to the Spider-Man logo story! Thanks to Stephen Wacker at Marvel for pointing this out. This entry was posted in Logo Studies on May 14, 2008 by Todd.